Police have named a "prime suspect" they want to trace after a female officer was seriously injured in a hit-and-run. 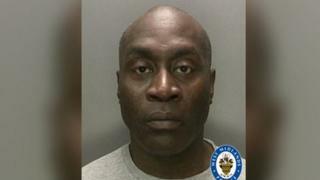 The 50-year-old West Midlands Police officer was struck by a car in Hatherton Street, Walsall, at about 09:00 BST on Thursday. The force said it wanted to speak to Clover Johnson, 51, over the incident. The injured officer remains in hospital with a serious head injury, broken ribs and punctured lung. The officer had been attempting to defuse a domestic incident when she was hit by the car, which was later found in Thames Road, Bloxwich. Det Insp Chris Fox said: "The thoughts of the force are with her and we are doing all we can to catch the person responsible."